1. Heat the stock in a covered pan until simmering. Leave on a low heat to keep hot. 2. Heat 1 tbsp oil and half the butter in the pan. Add the onion and cook until soft but not coloured. Add the garlic, and cook for 1 minute, then add the rice and cook over a low heat for 1-2 minutes. 3. Add the stock, a bit at a time, and cook, stirring. the stock must be absorbed before you add more. 4. 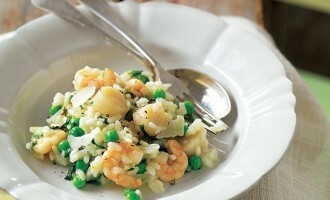 When the rice has been cooking for 15 minutes, add the peas and parsley (or mixed herbs) with a ladleful of stock. Heat until simmering and continue to cook, adding the stock, until the rice is tender (you may not need all the stock). 5. Heat the rest of the oil and butter in a frying pan and cook the prawns and scallops for 5–6 minutes over a medium heat until just cooked (they'll turn pink). Add to the risotto with the pan juices. Divide between four bowls and serve topped with Parmesan.